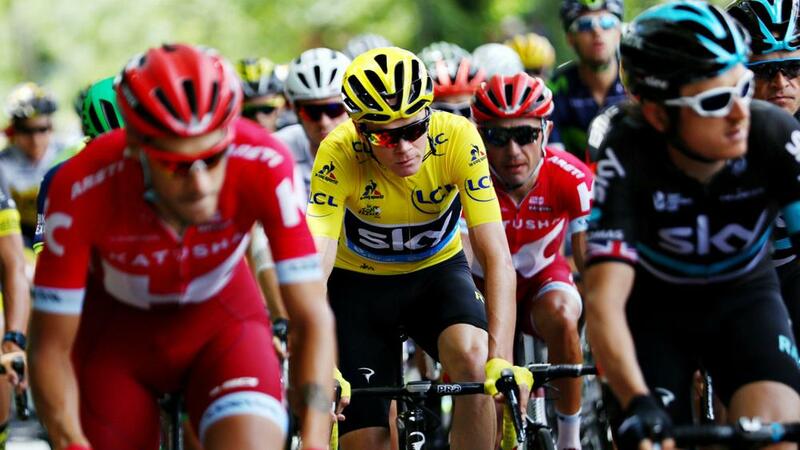 A crash with a camera motorbike resulted in Chris Froome, wearing the yellow jersey at the time, running part of the final climb on stage 12 of the Tour de France and losing valuable time in the general classification. With swathes of fans encroaching on the road making for a narrow route on the ascent up Mont Ventoux, BMC Racing rider Richie Porte ran into the back of a breaking motorbike. Froome was caught in the subsequent pile-up as he ploughed into Porte and opted to progress on foot in a bid to avoid losing valuable time. GC rival Bauke Mollema (Trek-Segafredo) was also involved, but got away quickly. Team Sky rider Froome transferred to a neutral bike after jogging up part of the hill for less than a minute before finally being handed a replacement to cross the line. Adam Yates (Orica-BikeExchange) will provisionally take over the yellow jersey as Froome drops to sixth – some 53 seconds off the pace having started the day 28 seconds clear of the rest - while Thomas De Gendt claimed his first stage victory on the Tour de France. The stage had been shortened by six kilometres due to high winds at the summit of Mont Ventoux.